This David Boder looks like another spotty bourgeoise kid like yourself and of course being a Communist like you another pathological liar. No I know how fictions of Talehani's eye lids being removed become facts for you Communists. Ah so you refute being spotty but not that you are a bourgeoise. Good, at least we have established you are a bourgeoise kid who doesn't like working class kids who have done well for themselves . Most of the pictures posted are actually from the Quds demo! Where are the pictures of the counter demo? I think you managed the Counter Demo very well. 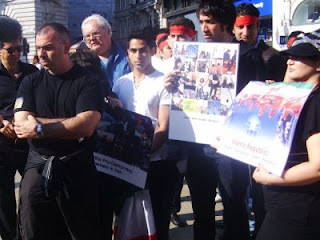 I saw no trouble between the different groups who had turned up to support you, and they all managed to vent their disapproval at the supporters of the Iranian regime when they walked past. I was also standing near the "March for England" contingent for about an hour, and never heard them chant anything racist, let alone fascist. So as far as I'm concerned, the poster above named "Hanif Leylabi" is talking nonsense, and you made the right decision to let them stay at the march. I also notice that the poster called hanif Leyabi gives a link to a Communist site, when Communism is itself a totalitarian ideology. Not quite sure how he can claim any sort of moral high ground over anyone else then! How come none of you "Socialists" labelled him then? Arash - He has shown his right wing colours pretty consistently, so writing a blog licking Ann Leslie's arse with a pic of him with her is reason enough to label him. And you just do not hug racists. And if you cannot see that March for England people are racists and probably fascists then you are blind. Amicus - Since you seem a fountain of knowledge on socialism, perhaps you can enlighten me as to how it is a totalitarian system? Potkin - my class? When I was very young we had to all live with my grandparents and my Dad worked 80 + hours a week. As I got older we got richer and I have had many fantastic opportunities many people may age will never have. I hope that answers your question once and for all. Hanif, the only racist or bigot here seems to be you. Ourselves the UBA marched with M4E and i being the leader of the UBA will not tolerate anything racist in my organisation. We have a couple of black boys, 2 Indians and 1 mixed race lad...racist eh??? The chap i spoke to with my girlfriend actually heard me wondering about the possibility of 'reds' attacking us coz they might think we were far right. However, i saw 1 or 2 possible 'Neo-Nazis' near us which made me feel uncomfortable as i did not want to associate with these cretins. Please don't quote on nothing you clearly do not know anything about. I said Communism is a Totalitarian system, not Socialism. Why don't you read what I said. And why don't you actually come up with some evidence that the "March for England" group are fascists? Or do you just consider anybody who waves an England flag to be fascist? Where was the opositioan, they always show us on our media? UBA - I know nothing about your organisation and haven't commented on it. If you were shouting 'terrorist bombers off our streets' with the clearly racist M4E skinheads then you are a racist. Anon - I said they were possibly/probably fascists. Young white men with england flags screaming abuse such as 'terrorist bombers off our streets' at a demonstration of mostly non white people in the current climate of racism is indeed racist and smacks of the tactics of modern fascists in the UK. What do you mean by Communism? And what do you mean by socialism. Stalin and Trotsky would have described themselves as both socialists and communists. but were they similar? Hanif's logic is wonderful. Anyone who doesn't like terrorists and who has an intolerant attitude to people who plot to kill civilians in tube trains, buses, airports and nightclubs is a Nazi. how can it be racist shouting "terrorist bombers off our streets" if the hizb lot are terrorists. hope your funding is good, as slander is a nice case. do you educate yourself outside your own realm and teachings... Both U.B.A and M4E stand united with Potkin and this group, And we will continue to support him, we are not uniting to brainwash him and turn him to our views and policys..